Day Four of the Tour d'Enfer will see the Tour de France go by us. This preview suggests a few ways to watch. 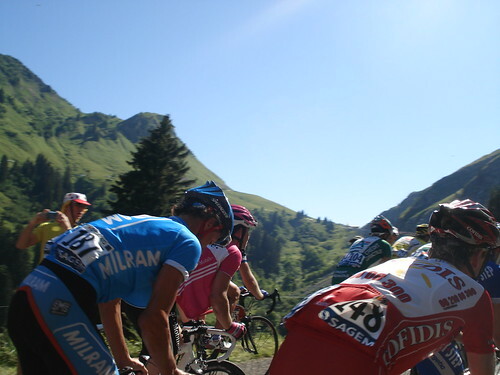 Here is a preview of stage four of the upcoming July 2008 Lost Boys Tour d’Enfer. A trip organized by my friend Leslie that will include people from the USA, Canada, France, Turkey, Germany, and Switzerland. All 2008 Tour d’Enfer Previews can be found here. Day Four of the Tour d’Enfer will see the Tour de France go by. This preview suggests a few ways to watch. Today will be stage 17 of the Tour de France. The last massive mountain day, and perhaps the day that determines the winner. The stage goes right through Briancon. See this link for an overview and map of the Tour de France Stage 17 route. The Map below offers three ideas for watching the tour – each explained below. As the Stage preview explains, the climbing starts in Briancon and ends in Alpe d’Huez. This is the Blue route on the map. Watching the Tour up Alpe d’Huez would be an amazing experience. It will be packed and the riders exhausted after a huge day. PLEASE NOTE: The distance shown is ONE WAY. This is a big ride and will require climbing back up to the Col du Lautaret on the way home. If you are dying to see the stage atop Alpe d’Huez but are worried about accessibility. Take the Purple route for a superb climb up the remote Col de la Sarenne into Alpe d’Huez from the back. Again, the distance quoted is one way. Again, the distances are ONE WAY. This is a huge Ride. 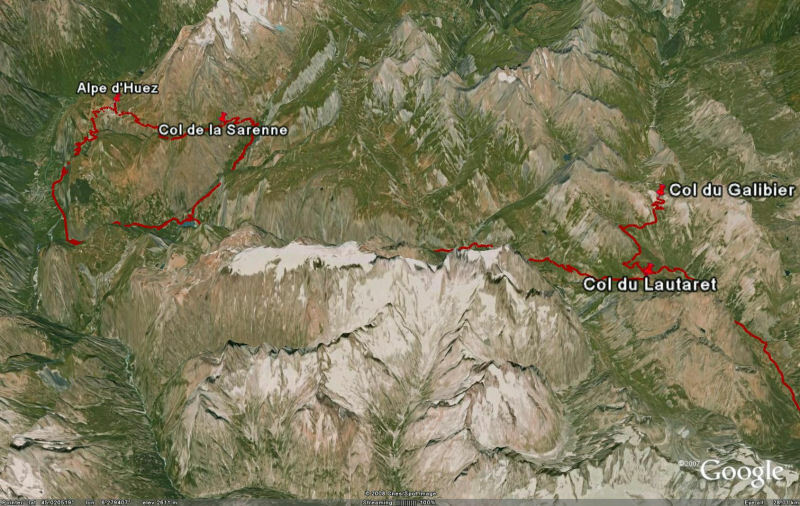 To find this road, just take the main road from Briancon to Bourg d’Oisans. Just before the dam and lake turn right at Mizoen. This is probably what I will do. Col du Galibier is the first of the three big climbs. 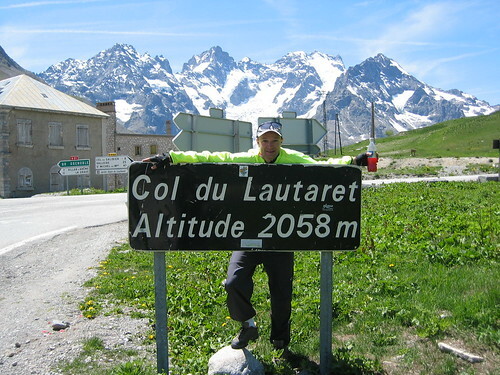 At Col du Lautaret, turn right (red route on map) for the last 5 superb miles. We’ll be climbing the more interesting North side of Galibier on Day 5 – but this side is still formidable and beautiful. Note the % grade chart above shows the climb to Col du Lautaret which is common and the first climb on all three suggested routes above. 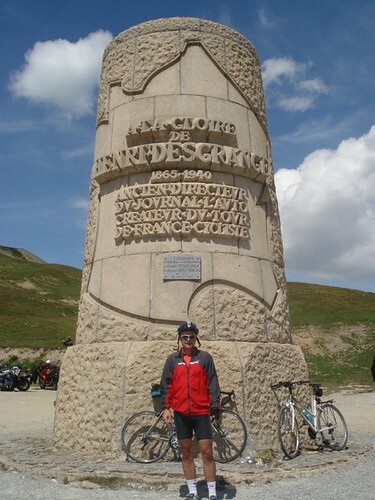 Just below the top of this side of Galibier is a giant monument to Tour founder Henri Desgranges – see photo. This route has the advantage of being entirely on the Tour route and completely downhill for the return. So if you are feeling tired you can stop any time, enjoy the Tour festivities and cruise home. The Tour will be passing right through town and there will certainly be festivities going on. This may be a fun way to recharge the legs – as the Tour d’Enfer doesn’t get any easier after today. Strewth, my knees are wobbling just looking at this lot! I know we have brainstormed about maybe driving to the base of Alpe d’Huez that day, but just in my opinion, it may be asking for MAJOR traffic jams on the way back. There is only one main road there and the Tour traffic will be crazy.